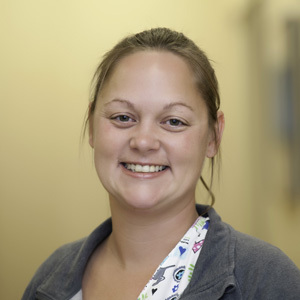 Stephanie has been doing veterinary work since graduating high school in 1999. She began with reception and general medicine while working as an assistant and quickly began doing more advanced technician work. After a couple years she began doing emergency medicine part time and quickly decided that was where she wanted to be - she has been doing emergency medicine ever since. Stephanie has also done a bit of rescue work. Stephanie brings compassion and knowledge to help explain and calm pet owners in stressful situations. "The thing I enjoy most about my career choice is seeing pets go home healthy with thier loving families. It's rewarding to know I have the skill and knowledge that helped them heal." Stephanie was born and raised in Michigan, but left to work in St. Louis for 8 years. In 2015 she returned to Michigan and joined AEC. Stephanie loves being back here with her family and loved ones. Stephanie has a dog (Annie) and 4 cats (Chicklet, Tudie, Rocky, and Rascal) and also enjoys camping and spending time in the sun.